Seven teams have been crowned Ontario Cup champions, with six of those now moving on to the Toyota National Championships. 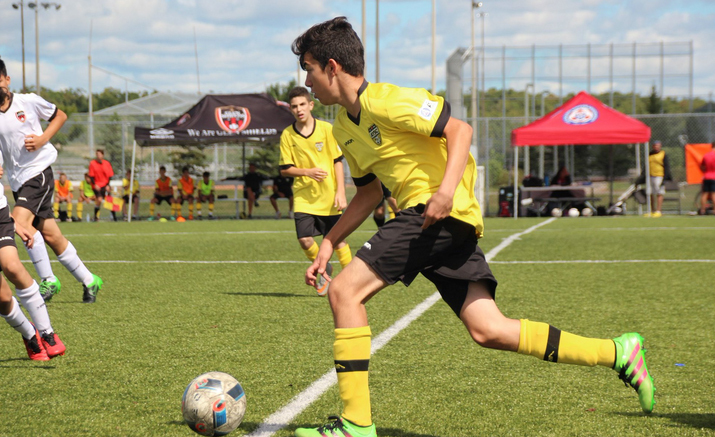 The provincial soccer for life championships concluded for a number of divisions in Vaughan this past weekend, with thrilling action taking place across the board. Click here to find out who won and stories, photos and highlights from every game. The Ontario Cup finals are now locked in. Semi-finals took place across the province and after starting with over 600 teams, the competitions have now been whittled down to the final two. 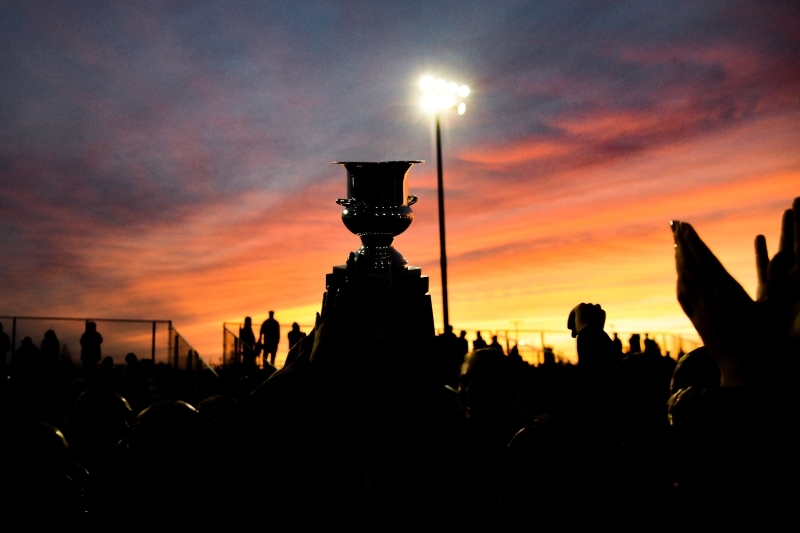 The finals will take place over Sept. 15-16 at the Ontario Soccer Centre. Click here for more information on how to watch. Ontario Soccer is pleased to announce ticket pricing for the Ontario Soccer Summit 2019, in partnership with Respect in Sport. 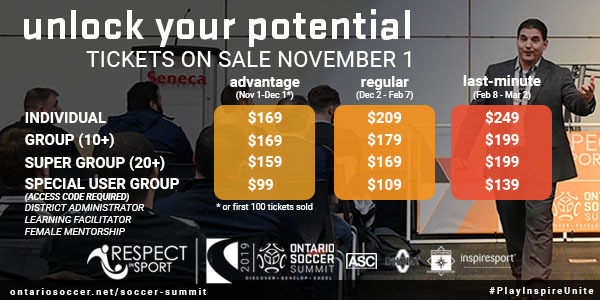 Tickets will go on sale Nov. 1, 2018 and the full roster of 2019 speakers will be revealed at that time, but to assist Clubs, Academies, Districts and Leagues in their planning, the options for purchasing passes to Ontario Soccer Summit 2019 have been released publicly. 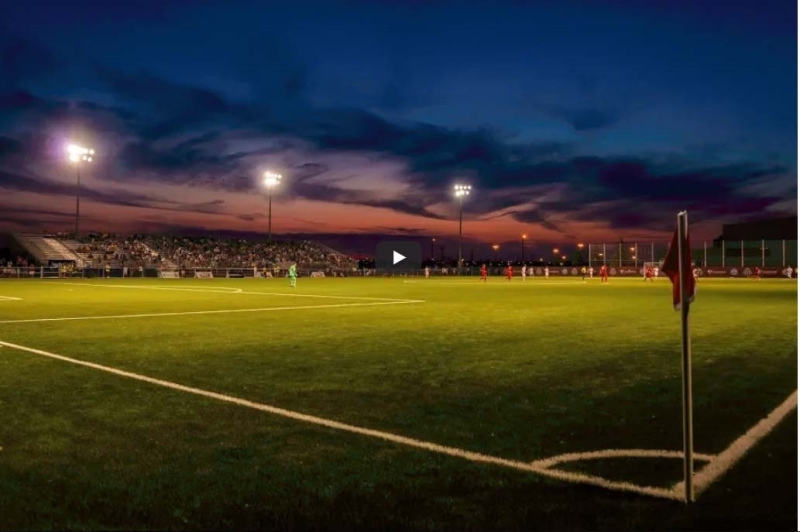 Click here for more information on ticket pricing and Ontario Soccer Summit 2019. The Nominations Committee has received no nominations from District Members for the Regional East Director and Regional South Director for the new Ontario Soccer Board of Directors. The term(s) of the Regional South Director and Regional East Director is for one year. As such, the Nominations committee is initiating a “Special Call for Nominations” for these two regions only. Click here for more information on how to nominate someone. 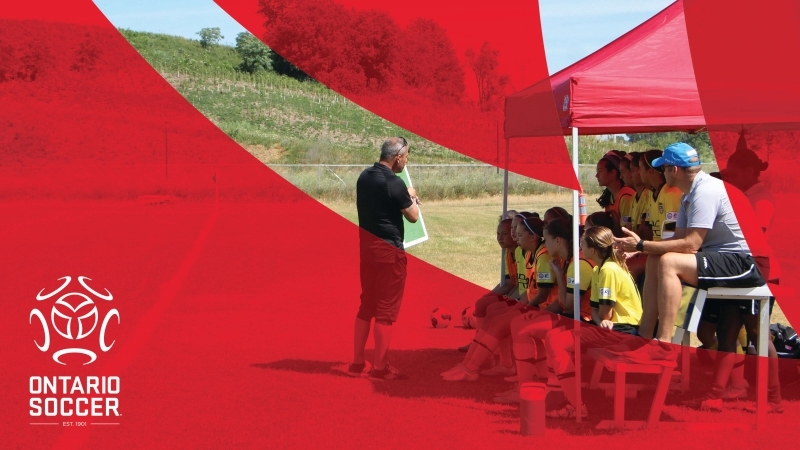 Ontario Soccer is continuously looking for experienced and passionate technical leaders with progressive approaches who can help shape the new Player and Coach Development pathway and is now asking for applications for Learning Facilitators (LFs) for 2018-2019. Ontario Soccer’s LF holds a tremendously important role in implementing the delivery of the current Long Term Player Development (LTPD) pathway. Click here for information on how to apply and role requirements. 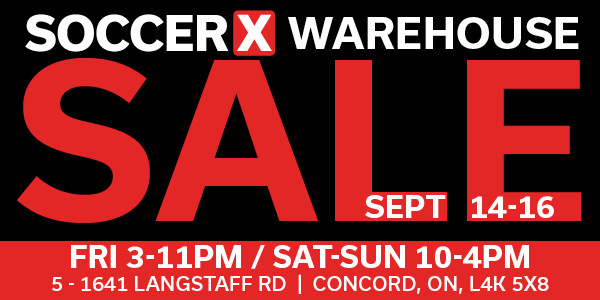 SoccerX, Ontario Soccer’s Official Apparel and Equipment Supplier, is having a huge warehouse sale. Ontario Soccer members have been invited to an exclusive Preview Sale on Sept. 13 from 3 p.m. – 11 p.m., with the General Sale continuing from Friday to Sunday. Click here to RSVP to the event. Ontario Soccer is pleased to announce the date and location of three upcoming Coach Development opportunities. Information is now available for an upcoming C License Course, Technical Director Diploma and Goalkeeper Diploma courses. Click here for information on the courses and how to register. Durham United FA women won the 2018 League1 Ontario Championship Final, after defeating the Woodbridge Strikers in kicks from the penalty mark. The men’s division then took centre-stage, with a short Matchweek 15 and a full week of action in Matchweek 16, offering surprises at both ends of the table. 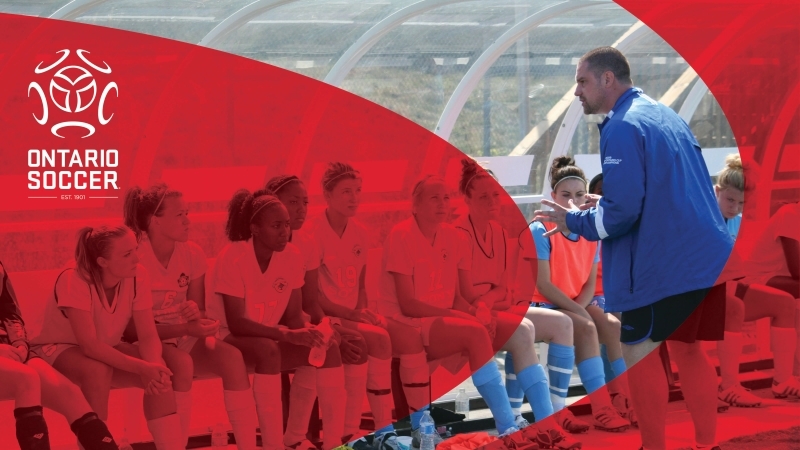 Click here to get caught up on all things League1 Ontario. This week features comments from Dave Diplacido, Technical Director of Aurora FC, on how OPDL has impacted their organization. Click here to read this week’s spotlight. Each week focuses on one of the three LTPD development stages at the Grassroots level, which includes Active Start, Fundamentals and Learn to Train. Click here to find and download this week’s practice. 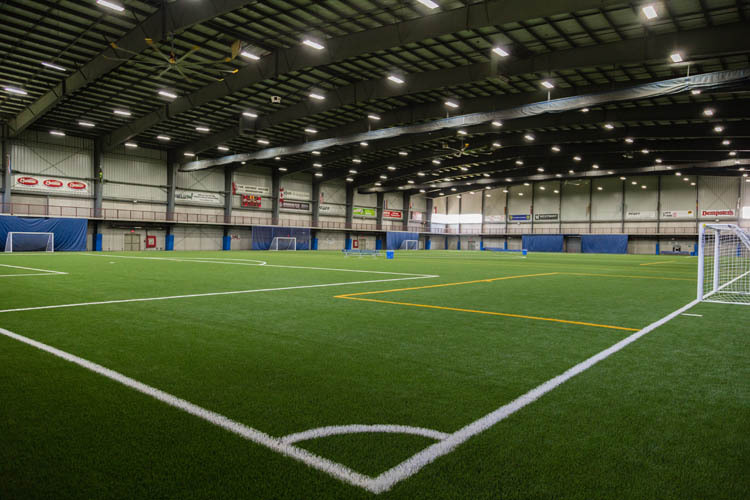 The Provincial Indoor Soccer League is currently accepting team applications for its 2018-2019 season. The league is open to Ontario Soccer club teams and OASL academies for U14-U18 boys and girls teams. Canada Soccer’s Men’s National Team scored a record-setting 8-0 victory in their first CONCACAF Nations League match. The eight goals marked the most-ever in international competition for the Men’s National team in a match that featured three teenagers in the starting 11 for the first time in a senior competitive match. 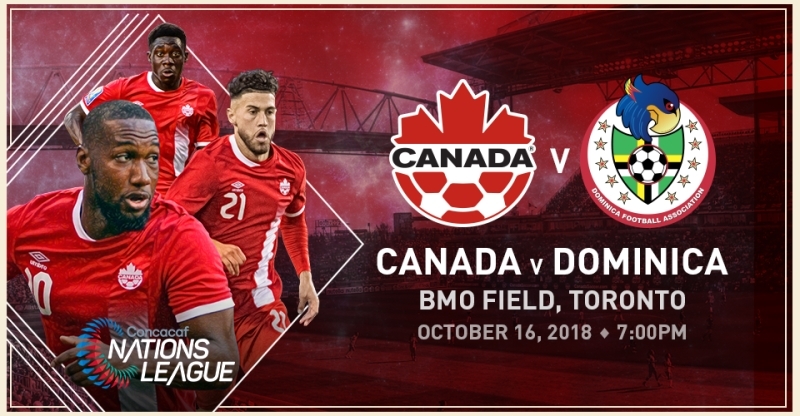 Have you purchased your tickets yet for the Canada vs Dominica? 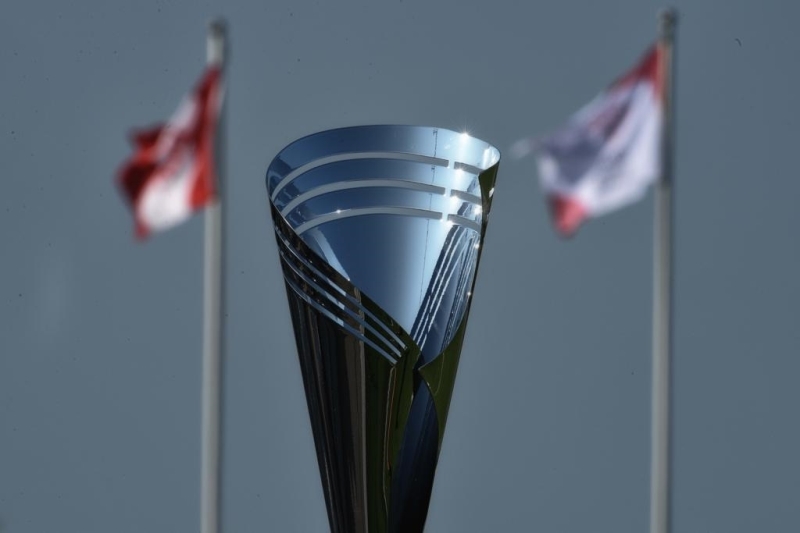 Canada will play their first home match in 2018-2019 CONCACAF Nations League qualifying on Oct. 16 at BMO Field. Canada will face Dominica in the first 2018 home match with a 7 p.m. kick-off. Tickets are already on sale. Click here to read more about this game and the CONCACAF Nations League. 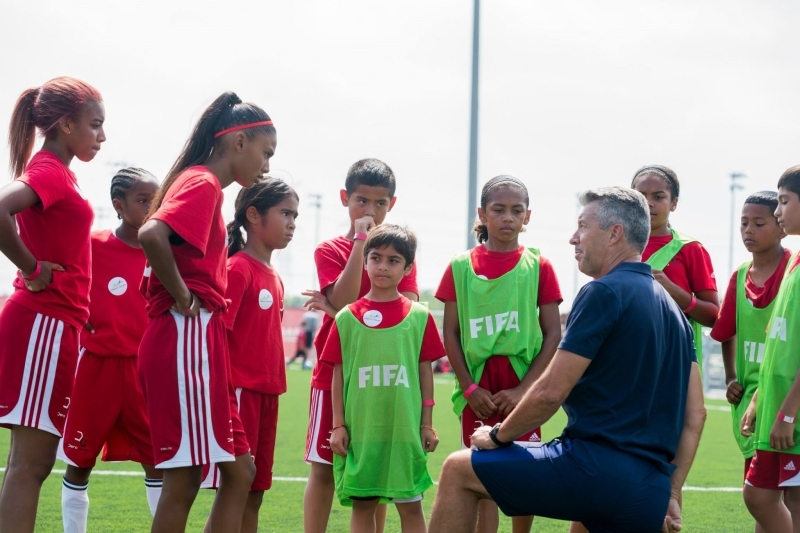 The Canada Soccer Club Licencing Program takes a principles-based approach which allows organizations to develop and select the methods by which they operate based on their available resources and context. 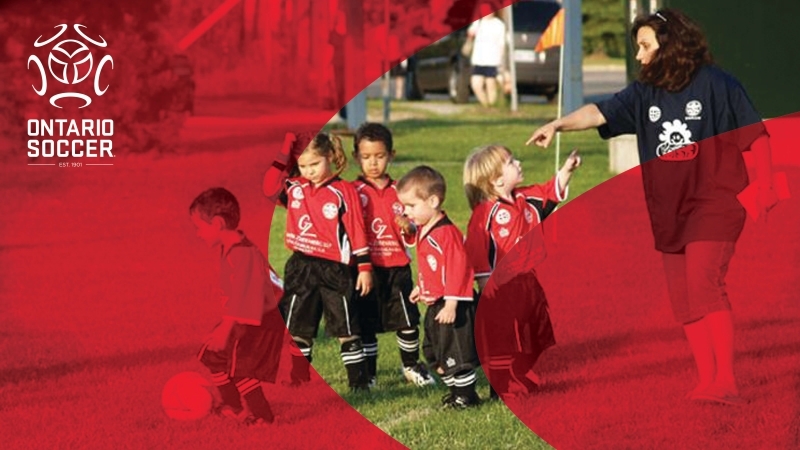 The program has four categories for all youth Clubs and private Academies in Ontario and Canada to apply. Click here to read more about this program and its categories. The Masters Provincial Championships wrapped up recently at the Civic Stadium in Oshawa. Two champions were crowned. The Men’s Over-35 Masters Championships saw Scarborough GS United come out on top. Click here to read the match recap and find photos. The Women’s Over-30 Masters finals saw the Cumberland Cobras lift silverware. Click here to read the match recap and find photos. 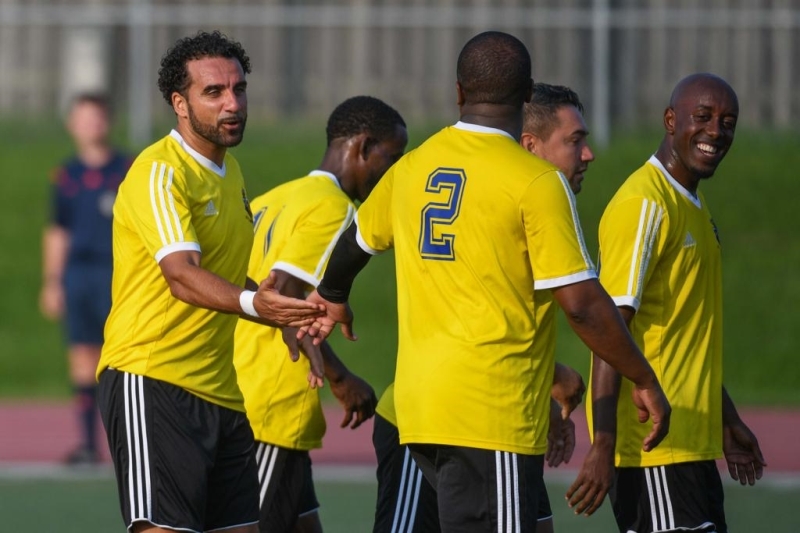 Both teams now move on the Canada Soccer Regional Club Championships. Ontario Soccer is continuing to show that the safety of their athletes and participants are a priority to the community. This week, Respect in Sport revealed that Ontario Soccer has surpassed 20,000 certifications in the Respect in Sport Activity Leader program. This is in addition to the 10,000 parents who have already been certified in the Respect in Sport Parent Program. 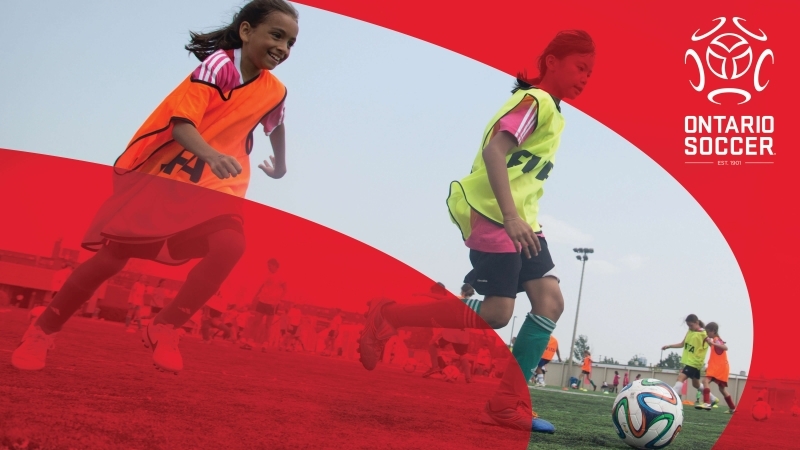 Click here to read more about Ontario Soccer’s commitment to keeping kids safe. On June 9, 2018, upon positive review of beta test results and survey data, the Ontario Soccer Board of Directors approved the move to Phase 2 of the three-phase implementation plan for the new SportsEngine Member Management Registration System (MMRS). The Board of Directors has approved, effective for the Outdoor 2019 season (for which registration can occur no earlier than Oct. 1, 2018) and for all seasons thereafter, SportsEngine’s MMRS will be the official record of registration for Ontario Soccer. This launch period all commences the retirement of AIMS which will be maintained for archival purposes only effective Oct. 2019 season. The official retirement of AIMS is effective at the end of the Indoor 2018-2019 season. Click here to read the Top Ten Frequently Asked Questions.